JACKSONVILLE, Fla. - We saw a few isolated showers pop up this afternoon, the drier weather pattern is starting to erode. The isolated showers should fade around or just after sunset. Tonight will be warm and muggy, with overnight lows only getting down into the mid 70s. Friday starts out partly cloudy and warms quickly. Expect to top out in the mid to low 90s, but it will feel more like the triple digits. We will see a few afternoon storms firing up after 2pm. The latest chances for showers on Friday will be to the North of the State Line. Saturday our weather pattern gets back to what we expect this time of the year - partly cloudy to start, warm with afternoon storms for the rest of the day. 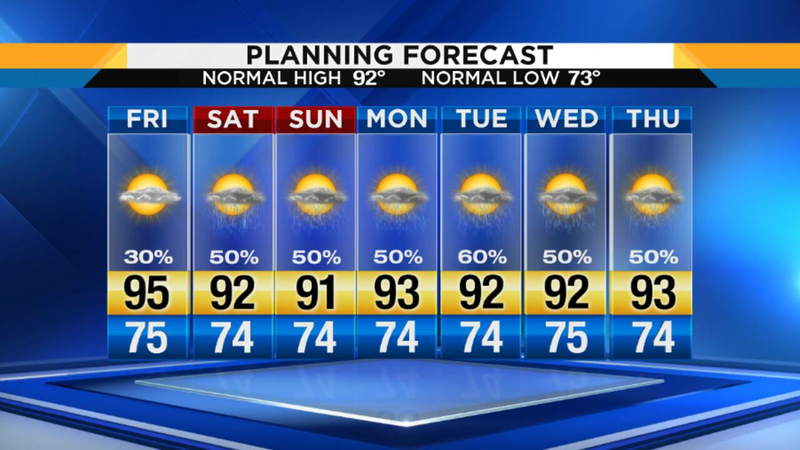 Expect to top out in the low 90s with 50% chances for rain. Sunday, expect more of the same. We start out with partly cloudy skies and warm up quickly. We will top out in the low 70s and warm up into the low 90s. Expect 50% chances for afternoon showers and thunderstorms.